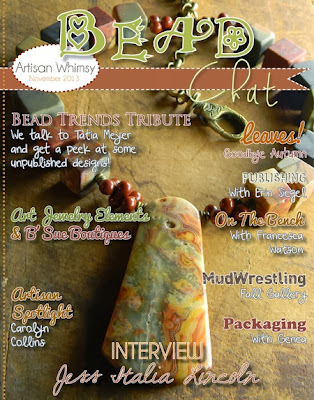 I wanted to give a big shout out to Melinda Orr and all the ladies over at Bead Chat Magazine and Artisan Whimsy. The November issue of Bead Chat Magazine is out and it's Fabulous! Bead Chat Magazine did a tribute to Bead Trends Magazine, since it ceased publishing this summer, and featured several of the jewelry designers and their designs that were in the 'hopper' about to be published by didn't quite make the last publication. 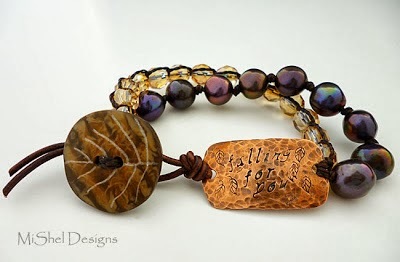 And, they did a feature on me since I was going to be the Beads Trends October Designer Highlight. They did a super job including all the designs that were to be in the spread and made everything look just wonderful. I can't thank them enough for publishing everything they did in the November issue of Bead Chat - thank you, thank you!! This month's issue is jam packed with all sorts of goodies so be sure to click here and check it out. And, some more exciting news - this month's the start of the all new and improved Artisan Whimsy site - be sure to go check it out as well. The comradery on this site is unmatched. People sharing, helping each other - it's pretty cool! There's lots of things in the works over there, so be sure to check back often. Okay - time to get back to work! I hope everyone enjoys their week! Peace, Love and Diggin' Bead Chat Mag! I'm still making my way through the entire magazine this month. It's just jammed-packed w/all sorts of awesome designs and great information - fabulous issue! !